Welcome to Austenesque Reviews, Skylar Hamilton Burris! I am very excited and honored to be to be interviewing you. Thank you for taking the time to answer some of my questions. I’ve been writing since childhood, and I suppose it was, from the very beginning, other people’s writing that inspired me to write. I began writing poetry because of Dr. Seuss and Bob Dylan (a musician I heard played on the stereo since birth), and the first major prose piece I can still recall writing was a Nancy Drew minimystery, which I penned in 4th grade. That little novelette was a work of fanfiction, before fanfiction even had a name. So I guess it’s not surprising that I should have gone on to write books inspired by a novel of Jane Austen. What genre of books do you enjoy reading? Who are some of your favorite authors? I read fairly widely, and I probably consume more nonfiction (on topics ranging from sociology and economics to theology and politics) than fiction. When it comes to fiction, I generally enjoy classics and contemporary literary fiction most. Some of my favorite authors are Charlotte Bronte, Herman Wouk, C.S. Lewis, Oscar Wilde, Chaim Potok, Elie Wiesel, and, of course, Jane Austen. I tend to like individual books more than I like individual authors. Where and when did you first discover Jane Austen? Do you have a favorite Jane Austen novel? I first read Jane Austen’s Pride and Prejudice as a high school assignment. It still remains my favorite Jane Austen novel, but Northanger Abbey is a close second. Northanger Abbey is certainly, to my mind, her funniest and most entertaining novel, but Pride and Prejudice still edges it out for me. What inspired you to write a Pride and Prejudice sequel and make Georgiana Darcy the focus of it? Conviction began as mere fanfiction, which I posted bit by bit on austen.com’s Derbyshire Writer’s Guild. It evolved, however, into a full length novel, which underwent some massive revisions prior to publication. I decided to make Georgiana the focus because I was always curious about her as a character. It may be because I sometimes feel my own shyness is misinterpreted as aloofness that I became intrigued by a character who was initially misjudged by others to be proud. When did you begin to work on Conviction? Can you tell us about your experience of getting your book published? I began work on Conviction in the late 90’s, and over the next few years it grew into a novel. After shopping it around to publishers for awhile, I eventually decided that because it is geared toward a small niche market, I should publish it myself. I did so using a print-on-demand company in 2004. The book was more popular than I anticipated, and it was picked up by a small press publisher, Double Edge Press, in 2006, which republished the novel in a revised, second edition. Prior to republication, I added an additional chapter as well as some other revisions. Two years later, Double Edge Press offered me a contract for my second Pride and Prejudice sequel, An Unlikely Missionary. In Conviction, Georgiana Darcy has gained some confidence and courage. What inspired you to portray her this way? Can you share with us how you developed your Georgiana? Georgiana is described as shy in Pride and Prejudice, though Elizabeth Darcy first assumes she aloof. We know she was mislead by Wickham, and she is young in Pride and Prejudice. Given that Mr. Darcy matures in Pride and Prejudice, I thought it only fair that his younger sister should have her chance to mature. No doubt her misfortunate experience with Wickham taught her a thing or two about life, and I suspect that having a lively sister-in-law like Elizabeth Darcy would persuade her to come out of her shell. (POSSIBLE SPOILER ALERT) In your novel you bring Kitty to the forefront and find her a match, although it isn’t a very romantic one. What motivated this decision? Jane Austen is sometimes described as a writer of romance novels, but in fact she is not really a Romantic in the literary sense. Rather, her novels are satirical and realistic, and they show an awareness of the limitations of life and often mock excess of sensibility. I thought it in keeping with this perspective to allow one of the characters to form a satisfactory, but not romantic, match. Can you tell us a little about how you developed the new and captivating characters you created: Major Talbot, Jacob Markwood, Aaron Markwood, and Niles Davidson? It’s difficult to say how I develop characters. They tend to develop themselves. As I was writing, I found that the characters, particularly Jacob and Aaron Markwood, took on lives of their own. I often didn’t know what they were going to say or do next. There are themes of faith and God present in your novel. What prompted you use these themes and stress the importance of faith in a Jane Austen sequel? I try to be a more “secular” writer, but the truth is that these themes seem to creep into my works almost naturally. I am not a fan of didactic novels, and so I try to make these themes a natural and non-intrusive part of the story. Jane Austen didn’t write a great deal about religion, but we certainly see moral themes portrayed subtly in her novels, and the church is an ordinary part of her character’s lives. This is one of those areas where my own style creeps in, and I do not strive to be purely imitative. Adding more of a historical backdrop is another area where I deviate from Austen’s storytelling techniques. One big difference between Mr. Markwood and other Austen clergymen is how fervent and vocal he is about his faith. Do you believe that religion and faith was something openly discussed in society during Jane Austen’s time period, or was it more personal and private? I think it depended on the circles in which you found yourself. In Jane Austen’s novels, religion is an integral part of daily life, but it is not frequently talked about, and, when it is, it is mentioned with considerably calm. Mr. Markwood, as a more passionate and vocal believer, would likely have made many in his circle feel uncomfortable. However, we do know that during the Regency era, the evangelical movement gained widespread popularity and attempted to infuse more spirituality into a religion it saw as growing complacent. I thought it would be interesting to introduce one of these more evangelical characters (although Mr. Markwood is not precisely an evangelical; he is caught between two worlds, in a sense) into a circle of Jane Austen characters. Some of the characters in Conviction are abolitionists. What inspired you include slavery and the Abolitionist Movement in your novel? 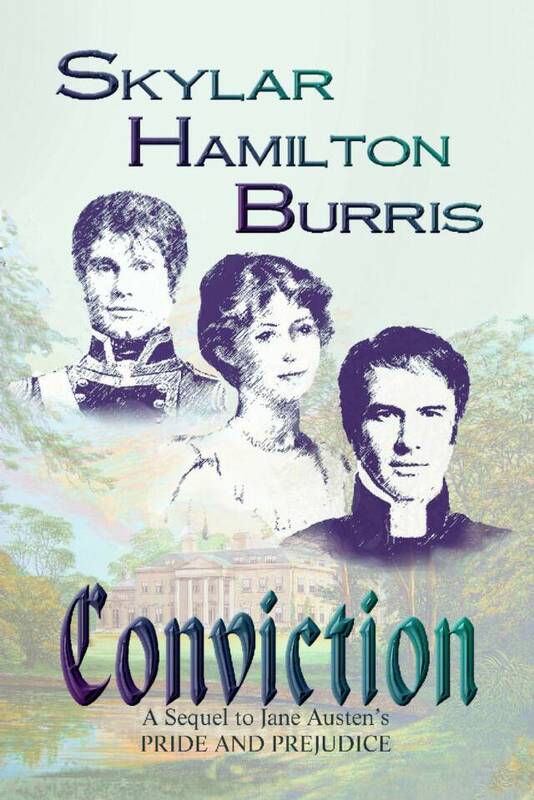 At the time I was writing Conviction, I happened to have been reading about abolition, and it seemed the topic provided a good opportunity to contrast the characters of Jacob and Aaron Markwood, their temperaments, and their passions. What was the most challenging part of writing this book? What scene did you have the most fun writing? The scene I most enjoyed writing was the one in which Major Talbot and Jacob Markwood talk alone in the church. In a way, the scene seemed to unfold itself, and I felt a great compassion for both of those men as I wrote it. The most challenging part of writing this book was the effort required to make it historically and socially accurate, and I am sure that despite my many hours of research, I probably slipped up in a place or two. You have another Pride and Prejudice sequel that was published in 2008 called An Unlikely Missionary, can you tell us a little about that novel? An Unlikely Missionary is a sort of belated coming of age story. It follows one of Austen’s lesser characters, Charlotte Collins. Charlotte is not one of Austen’s most popular characters, but I always sympathized with her. Given her position in society and her unfortunate lack of beauty, she really did not have very many options available to her. Yet Elizabeth is very disappointed in her when she decides to marry Mr. Collins. I wanted to give Charlotte a fair shake, to look more closely at why she might have chosen to marry such a man, how she would have dealt with their incompatibility, and to speculate on how she might have matured and developed through different life circumstances. In An Unlikely Missionary, Charlotte is caught up in an unlikely event: she and Mr. Collins, much to their chagrin, somehow end up as Anglican missionaries in India. In this new environment, Charlotte Collins begins to question her assumptions and values and to learn who she really is. Are you working on any new projects? Are there any other secondary characters in Jane Austen’s novels you would like to transform into heroines? I’m not currently working on any projects, but if I were to try my hand at another Austen sequel, I think I would like to write about Marianne and Colonel Brandon from Sense and Sensibility. And if I were going to tell the tale of a minor character, it would be Margaret Dashwood. [Meredith: I hope you do it one day, Skylar! There aren’t enouch S&S sequels out there! Thank you, Skylar, for sharing your thoughts and insights about Jane Austen, writing, and your novel, Conviction. Conviction, a satirical, original sequel to Jane Austen’s timeless classic Pride and Prejudice, reveals the romantic destiny of Georgiana Darcy. The story, however, does not rest on the laurels of Austen; an entirely new cast of characters is introduced, including an ambitious soldier, a wistful vicar, a flirtatious abolitionist, and an ordinary curate. The fates of these characters intertwine as each struggles to find the conviction to live out his or her own calling, while confronting issues of loyalty, courage, faith, and love. Conviction is not a novel merely for fans of Pride and Prejudice, but for all who take part in the ordinary struggles of humanity. GIVEAWAY TIME!!!! Today Skylar brings with her one lovely signed copy of Conviction to giveaway to one of my amazing followers! You can enter the giveaway by commenting on this post with a question or a comment for Skylar. **To have your name entered three times, post, sidebar, facebook, or tweet about this giveaway (please provide a link to let me know if you did this). This giveaway will end May 1st. Thank you for entering and best of luck!!! The wealthy and accomplished Georgiana Darcy has made her debut into society and has attracted quite an abundance of suitors. Some of these suitors are mostly attracted to her fortune and connections while others find her sweet and innocent disposition the main attraction. Under Mr. Darcy’s watchful and protective eye, Georgiana is courted by a variety of men, from politicians and abolitionists, to clergymen and soldiers. Mr. Darcy better be on his guard because Georgiana seems to have blossomed under the attention and admiration from one gentleman in particular, but is he the right man for her?